Writing a book, a research paper, or a script may seem intimidating when sitting in front of a blank word-processor window, trying to figure out where to start. Yarny is a cloud-based, distraction-free editor that can help writers stay organized and focused on their work. Yarny's interface is easy to use, with story snippets the left, notes on the right, and a distraction-free editor in the center. Unlike desktop solutions such as PageFour, YWriter, or even Scrivener, Yarny is a Web app that sits entirely in the cloud, eliminating the need to save your work locally and worry about backups. On the other hand, trusting a Web app with all your hard work does require a certain leap of faith, unless you're willing to constantly export your work. Yarny is available in two versions, free and Premium. A Premium account costs you $4 per month, or $36 per year, and gives you access to iPhone syncing, theme options, title and snippet duplication, and typewriter sound effects (yes, that's a Premium feature). If you don't need mobile syncing, and don't care much about appearances, the free account is more than sufficient for any budding writer. To get the most out of Yarny, start your writing process by creating an account. Yarny works much faster when you're logged in, and you'll also save yourself the trouble of losing work you've done on an anonymous account. Yarny is geared at writing books, but you can use it to write pretty much anything. After giving your project a title, you can also set a word-count goal, which you can then follow using an ever-present progress bar. Like working on several projects simultaneously? Click your project's title to create more projects, which you can easily juggle between. 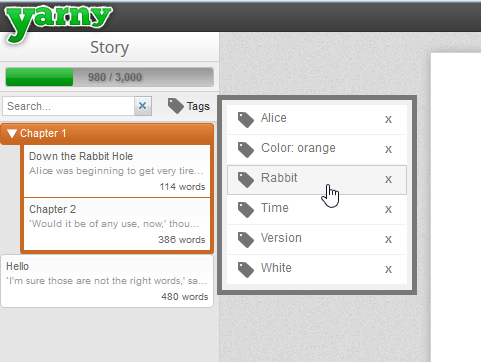 Yarny's workflow relies on snippets, where each snippet can be a chapter, a sub-chapter, or anything you want it to be. You can sort your snippets into groups, or simply use them as it. Both snippets and groups can be color coded, sorted and re-ordered using the drag and drop interface. The editing process is easy and distraction-free: As soon as you start typing in the editor, all sidebars fade away, leaving you with a white page and your text. To access the sidebars again, hover your mouse cursor in their general direction to make them re-appear. At the bottom of the editor you'll find a tag button, for adding tags to your snippet, and a versioning button, which lets you slide back to previous versions of this snippet. Your work is saved automatically all the time, and there's also a per-snippet word count and character count which is visible upon mouse hover. The versioning slider lets you slide back to earlier versions of your text. The versioning system is useful, but its application is somewhat lacking. While you can easily slide through previous versions and see when each one was saved, you can only do this while viewing the top of your page, which makes it impossible to see differences if they happen to be at the bottom. There's also no way to compare versions, so if you're not entirely sure what the differences are, you're going to have to eyeball it somehow. If you need background notes, or want to write down information that doesn't fit into the main project, the right sidebar offers People, Places and Things sections, where you can create more snippets and groups for your notes. All snippets, both here and in the main project, are searchable through keywords and tags, and can be shared for viewing purposes via a unique URL. When it comes to appearances, the free account lets you choose between three different standard font types (Sans-Serif, Serif, and Monospace) and three different font sizes. If you're a fan of dark backgrounds, you'll have to opt for the Premium account, as the free one doesn't offer any further control over appearance. You can search snippets and groups and sort them by tags and colors. Done writing? Yarny offers several export options for your work, as well as integration with Publification (a free publication platform for eBooks). You can export your entire project or parts of it into plain text, rich text, or ePub, and have the resulting document divided by snippets, groups, or both. Unfortunately, there's no import option at the moment, so the only way to get existing work into Yarny is by copying and pasting it into the system. Yarny is an easy-to-use writing environment that combines a distraction-free editor with useful organization tools. 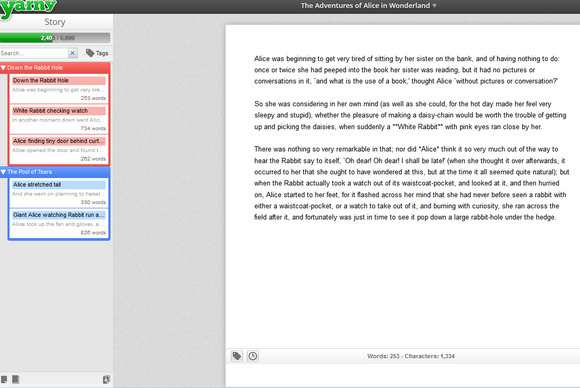 The interface feels well thought-out, and the features it brings can make it a valuable tool for writers of all kinds. As long as you have no qualms about working in the browser and saving your work to the cloud, or don't mind exporting your work every time just in case, Yarny could be the clutter-free solution you were always looking for. Note: The Download button takes you to the vendor's site, where you can use the latest version of this Web-based software. As long as you don't mind Web apps, Yarny can get you over that writing block.